On another beautiful Orange County spring evening, Trabuco Hills High School ran their season opening winning streak to six games with a 10-4 win over Mater Dei High School . The Monarchs got on the board first with a nice goal from Jack Southron after getting separation on a wrap-around attempt against the Mustang defense. The Mustangs came right back however and tied it up at one a piece, on a cutting goal from Billy Barron (2 goals, 2 assists) on a beautiful feed from Jake Marthens at the top of the crease. After trading possessions, Harrison Evans (5g) got a beautiful clearing pass from goalie Nick Wilson and buried a fast break attempt to go up 2-1. Trabuco gets goal number three from Barron assisted by Andrew Blume and now lead 3-1. Howie Gundy (7 of 13) won the ensuing face off to give the Mustangs possession and John Kauo capitiized burying the wrap-around from X and to extend the Mustangs’ lead to 4-1 at the end of the first quarter. Jake Marthens (22) assisted on the Mustangs first goal. Mater Dei, playing tough and inspired lacrosse, did not back down and opened the second quarter scoring with a nice man-up rip from Southron to make it a two-goal game at 4-2. Once again the Mustangs responded swiftly. Wilson, the goalie, took off on coast to coast clear before dishing off to a cutting Wyatt Koudelka (2g) who buried the shot to make the Mustangs lead 5-2. The Monarchs then battled back with a hard fought spinning effort from Caden Bevilacqua on a man up possession to cut the lead to 5-3 in the second quarter. Trabuco Hills finished up the half on a nice spinning left hander from Evans to go into the intermission with a 6-3 lead. Harrsion Evans (27) finished the evening with 5 goals. Jack Irvin’s goal with an assist from Nick Sando was the only point of the third quarter. making it 6-4 through three quarters. 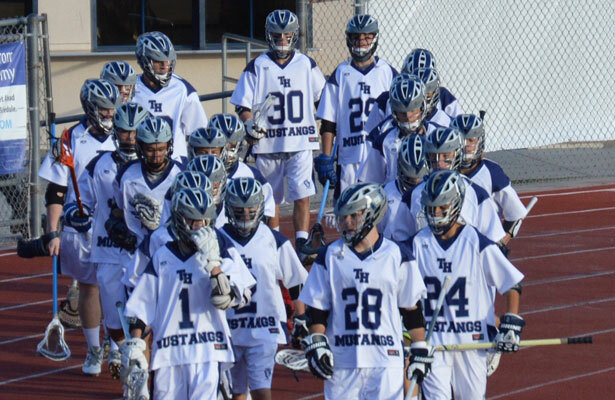 Faced with the possibility of an upset, the Mustangs outscored Mater Dei 4-0 in the final quarter. Evans got it started when he beat two defenders and finished a sweet running right hander to go up 7-4, and followed that up with his fourth goal of the evening to make it 8-4. The Mustangs taking advantage of two EMOs, closed out the game with Koudelka’s second of the night and Evans’ fifth. Barron dished out assists on the final two goals to complete his four-point evening. The Mustangs continue to roll and are now 6-0 on the season. They have their work cut out for them however as they head into league play and travel to San Clemente (3-3) and Aliso Niguel (4-2) next week. Mater Dei (2-4) hosts El Dorado on Tuesday.